Soon after orbital insertion, Cassini returned its best look yet at the heavily cratered moon Mimas (398 kilometers, 247 miles across). The enormous crater at the top of this banner image, named Herschel, is about 130 kilometers (80 miles) wide and 10 kilometers (6 miles) deep. Deeper than the Grand Canyon, Herschel stretches across nearly a third of the tiny moon’s diameter. The central mountain shown at the center of Hershel is the height of Mount Everest on Earth. This impact probably came close to disintegrating the moon. Traces of fracture marks can be seen on the opposite side of Mimas, suggesting that the destruction nearly split the satellite into two pieces. Although the icy moon bears a striking resemblance to the fictional 1977 ‘Death Star’ from the Star Wars film by George Lucas, this low-density satellite probably had a more likely past not as a weapon or space station, but instead as a victim of one catastrophic day in its ancient history. That day Mimas came closer to dying rather than committing any planet-scale homicide. The image was taken in visible light with the Cassini spacecraft narrow angle camera on July 3, 2004, from a distance of 1.7 million kilometers (1 million miles) from Mimas and at a Sun-Mimas-spacecraft, or phase angle of about 102 degrees. The image scale is 10 kilometers (6 miles) per pixel. The image has been magnified by a factor of two to aid visibility. Saturn currently has 31 known moons. Since Cassini’s launch, 13 new moons have been discovered by ground-based telescopes. 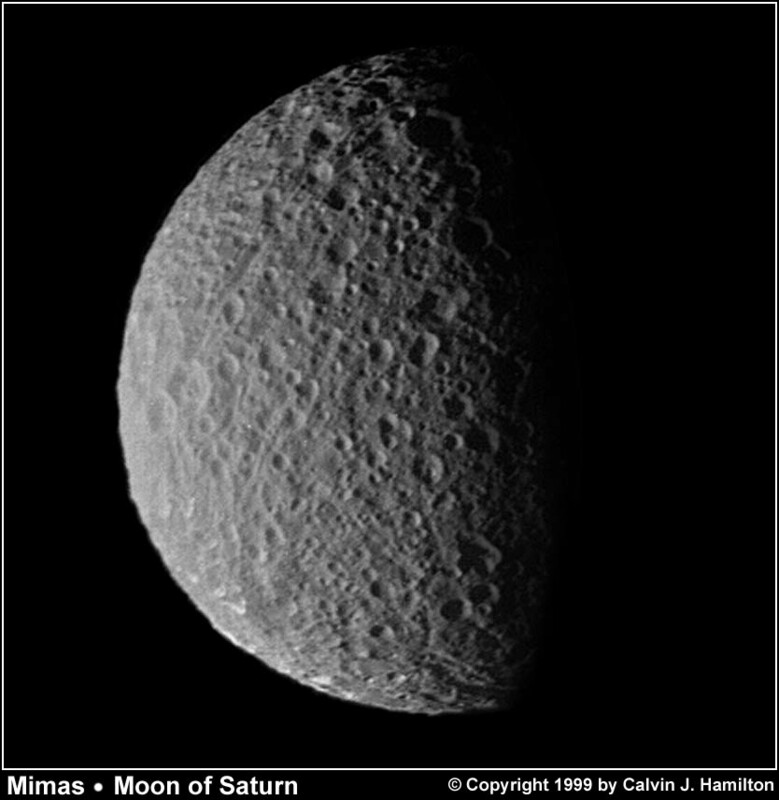 Mimas is named from a mythological Titan who was slain by Hercules. The moon was discovered in 1789 by William Herschel, for whom the huge crater is named after today. Mimas has a low density, meaning it probably consists mostly of ice. Because Mimas has such a low temperature of about -200° C (-328°F), the impact features may date back to the time of the moon’s creation. One prominent gap in the rings of Saturn–in particular the one known as the Cassini division– is caused by Saturn’s satellite Mimas, and a resonance condition set up between Saturn’s dust halo and the orbital period of the tiny moon. Fine surface texture of Saturn’s satellite, Mimas, in different lighting conditions from the Voyager I camera in November 1980. The seven-year outbound journey and four year orbital mission of Cassini-Huygens is a cooperative project of NASA, the European Space Agency and the Italian Space Agency. The Jet Propulsion Laboratory, a division of the California Institute of Technology in Pasadena, manages the Cassini-Huygens mission for NASA’s Office of Space Science, Washington, D.C. The Cassini orbiter and its two onboard cameras were designed, developed and assembled at JPL. The imaging team is based at the Space Science Institute, Boulder, Colo.